The 250 km coastline and its many islets, islands and skerries of the Ostrobothnian region provide excellent living conditions for pike. At the heart of the Ostrobothnian coastline is the unique Kvarken Archipelago, Finland’s only UNESCO Natural Heritage Site. The Fishing management fee is a federal tax-recurring fee, which is mandatory to anyone fishing between the ages 18 and 64. Angling with a hook and line and ice fishing are public rights and does not require payment of the fee. Paying the management fee entitles you to practice lure fishing using one rod, reel and lure across Finland. Apart from the paying the fishing management fee, the water owner's permission is always required for other type of fishing, such as net and trap fishing. Read more about the fee and how to pay it here. 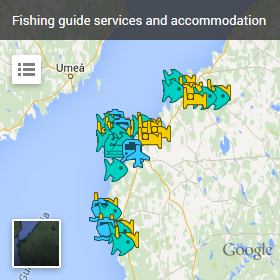 Find your fishing guide and place to stay in Ostrobothnia! Check out our brochure: Fishing in Ostrobothnia.